John Hancock was born in Yeovil, possibly the son of railway porter John Hancock (b1840) of 1 Kiddles Lane (today's Eastland Road). Sadly nothing else is known of John's early life but it appears that he moved to south Wales while his family, certainly a sister, remained in Yeovil. Although the date is unknown, John enlisted at Port Talbot joining the 9th (Service) Battalion, Royal Welch Fusiliers. His Service Number 37947 suggesting he enlisted during the summer of 1917. The 9th (Service) Battalion, Royal Welch Fusiliers was raised at Wrexham on the 9 September 1914 as part of Kitchener's Second New Army and joined 58th Brigade, 19th (Western) Division. They trained at to Tidworth, spending the winter in billets in Basingstoke, they returned to Tidworth in March 1915 for final training and proceeded to France, landing at Boulogne on the 19th of July 1915. Their first action was at Pietre, in a diversionary action supporting the Battle of Loos. In 1916 They were in action during the Battle of the Somme, capturing La Boisselle and being involved in The attacks on High Wood, The Battles of Pozieres Ridge, the Ancre Heights and the Ancre. In 1917 the 9th Battalion were in action in The Battle of Messines and the Third Battles of Ypres. 1918 saw the return of the war of movement and the 9th Battalion, Royal Welch Fusiliers took part in the Battle of St Quentin. The Battle of St Quentin began the German's Spring Offensive on 21 March 1918 and lasted until 23 March. It was launched from the Hindenburg Line, in the vicinity of Saint-Quentin, France. Its goal was to break through the Allied lines and advance in a north-westerly direction to seize the Channel ports, which supplied the British Expeditionary Force (BEF) and to drive the BEF into the sea. Two days later General Ludendorff, the Chief of the German General Staff, changed his plan and pushed for an offensive due west, along the whole of the British front north of the River Somme. This was designed to separate the French and British Armies and crush the British forces by pushing them into the sea. The offensive ended at Villers-Bretonneux, to the east of the Allied communications centre at Amiens, where the Allies managed to halt the German advance; the German Armies had suffered many casualties and were unable to maintain supplies to the advancing troops. Much of the ground fought over was the wilderness left by the Battle of the Somme in 1916. The action was therefore officially named by the British Battles Nomenclature Committee as The First Battles of the Somme, 1918. The following day the battalion was involved in the First Battle of Bapaume. In the late evening of 24 March, after enduring unceasing shelling, Bapaume was evacuated and then occupied by German forces on the following day. After three days the infantry was exhausted and the advance bogged down, as it became increasingly difficult to move artillery and supplies over the Somme battlefield of 1916 and the wasteland of the 1917 German retreat to the Hindenburg Line. On 25th the troops were ordered to withdraw and reorganise. 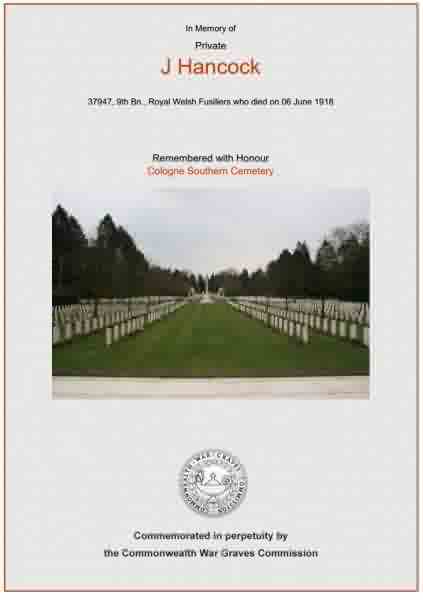 The 9th (Service) Battalion, Royal Welch Fusiliers were next engaged in the Battle of the Lys (7–29 April 1918). Also known as the Lys Offensive, the Fourth Battle of Ypres, the Fourth Battle of Flanders and Operation Georgette, this was part of the 1918 German offensive in Flanders, also known as the Spring Offensive. It was originally planned by General Ludendorff as Operation George but was reduced to Operation Georgette, with the objective of capturing Ypres, forcing the British forces back to the channel ports and out of the war. In planning, execution and effects, Georgette was similar to (although smaller than) Operation Michael, earlier in the Spring Offensive. During the battle John Hancock was shot in the leg, fracturing his right thigh. He was captured and sent to a prisoner of war camp in Germany. He died from his wounds on 6 June 1918 at Cologne, Germany. The Western Gazette, in its edition of 6 September 1918 reported "News has been received by Miss M Hancock of Lyncroft, The Park, of the death of her brother Private Hancock, of the Royal Welsh Fusiliers. He died on the 6th June at Cologne, Germany, from shot wounds which fractured his right thigh. Private Hancock joined from South Wales, but was well-known in this district. He was wounded and taken prisoner in France on the 10th of April 1918. John Hancock was interred in Cologne Southern Cemetery, Germany - Grave VII.B.27. His name is inscribed on the War Memorial in the Borough. 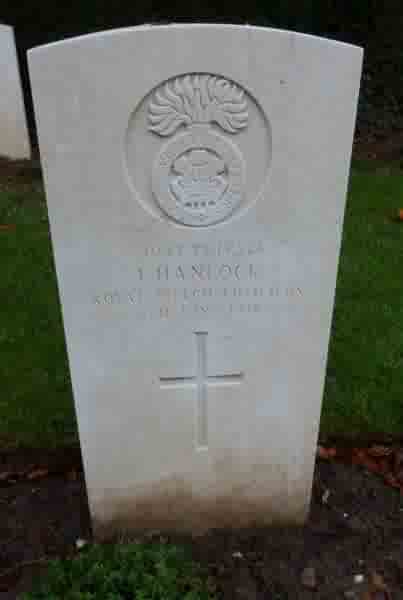 The Commonwealth War Graves Commission headstone for John Hancock. The Commonwealth War Graves Commission certificate in memory of John Hancock.